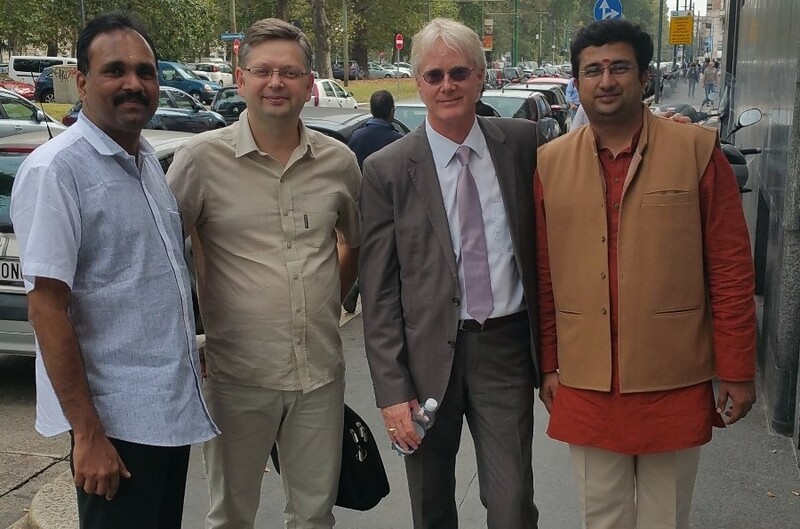 ​The next step of our scientific European trip was the 3rd International Ayurveda Congress in Milan, Italy. 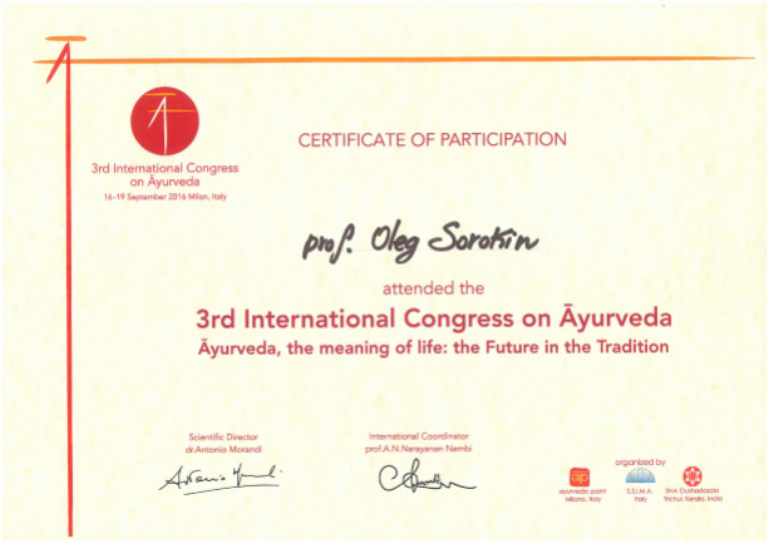 The Congress was organized by one of the oldest Ayurveda associations in Europe – Ayurvedic Point – founder of which is our friend and renowned expert – Dr. Antonio Morandi. This trip was packing a pool of important meetings for us and we will tell you about them in this article. Story from Oleg Sorokin, the leading ideologist and developer of the VedaPulse device, founder of Biokvant company. Ayurvedic Point is one of the oldest Ayurvedic associations in Italy founded by Dr. Antonio Morandi. This Association stands out from the other ones mainly because of its high level of academism and popularization of Ayurveda among medical specialists. In its activity Ayurvedic Point makes the main focus on creating the objective basis for Ayurveda in the context of modern requirements of provable medicine for Western doctors. At the Congress, I had two presentations that attracted interest to the Russian scientific developments in the field of Ayurveda. The first lecture was dedicated to the history of development of HRV-technologies as followers of palpation pulse analysis. In this lecture I also gave details about the main theoretical prerequisites and algorithms that lie in the basis of pathological Dosha state analysis. The audience consisted of doctors, naturopaths, diet specialists and manufacturers of Ayurvedic medicines. ​At the scientific part of the Congress I gave a presentation about «Comparative study of the diagnostic matching in determining pathological Dosha imbalance using the clinical method and the method of analysis of heart rate variability through VedaPulse software algorithms»which caused many discussions right after the presentation and later during the event. As a result of the presentation, together with Dr. Ram Manohar and Dr. Antonella Della Fave, we agreed to develop a strategy for further validation studies of the VedaPulse algorithms with the focus on fundamental studies in the field of heart rate variability. 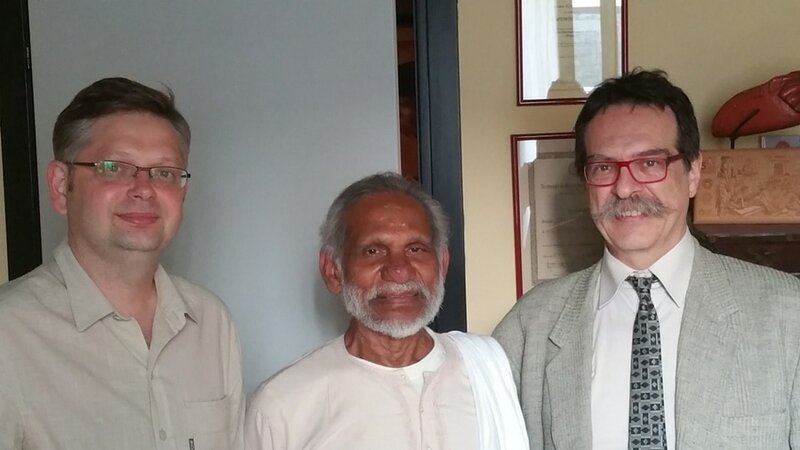 ​One of the main meetings during this trip was the meeting with the director of Ayurvedic Point, president of the Ayurvedic Medical Association of Italy – Dr. Antonio Morandi. He is a big figure in the scientific Ayurvedic community and is a part of many Ayurvedic, complementary and alternative medicine associations within Europe. One of his main projects is the program for Ayurveda doctors and his school Ayurvedic Point is an example of training such specialists throughout the world. ​I also had a chance to meet the spiritual advisor of Dr. Morandi - Swami Joythimayananda. As Dr. Morandi said, mister Swami is the person without whom existence of the Ayurvedic Point and development of Ayurveda in Italy as whole would not be possible. I invited Dr. Morandi and Mr. Swami to visit Russia to give lectures on Ayurveda for our specialists. In Ayurvedic tradition there is an unspoken rule, according to which, during studying Ayurvedic medicine, teachers open up spiritual connections between their students. Often Ayurvedic doctors have such spiritual brothers that help each other throughout life. Such spiritual brother of Dr. Antonio Morandi is Dr. A. N. Narayanan Nambi. At the Congress he gave a presentation where he showed detailed analysis of the two medical systems – Ayurvedic and Western, showing both their similarities and serious differences in healing approaches. The most positive emotions I had from a meeting with Dr. Atreya Smith. Despite the fact that by default we had known each other for some time already, we first met in person in Ayurvedic Point at the Dravyaguna lecture. This was an excellent expert lecture, where he shared the main principles he used when creating Ayurvedic description of the Western medicinal herbs. Dr. Atreya Smith is a person who played a big role in my life in the context of understanding the principles of Ayurvedic herbal therapy. Mainly thanks to his works, for the past three years I’ve had a chance to work on the new extension “Ayurvedic herbal encyclopedia” that will be launched in 2017. Currently, together with my team I’m working on the translation of a very important book, in my opinion, for the specialists practicing Ayurveda in Russia and Europe – “Dravyaguna for Westerners”. . Dr. Atreya Smith received a blessing from the keepers of Ayurvedic traditions in India for describing Western medicinal herbs in the context of Ayurvedic theory. He is the only doctor in the world who found the strength to do this important work for the Western clinical herbal therapy. 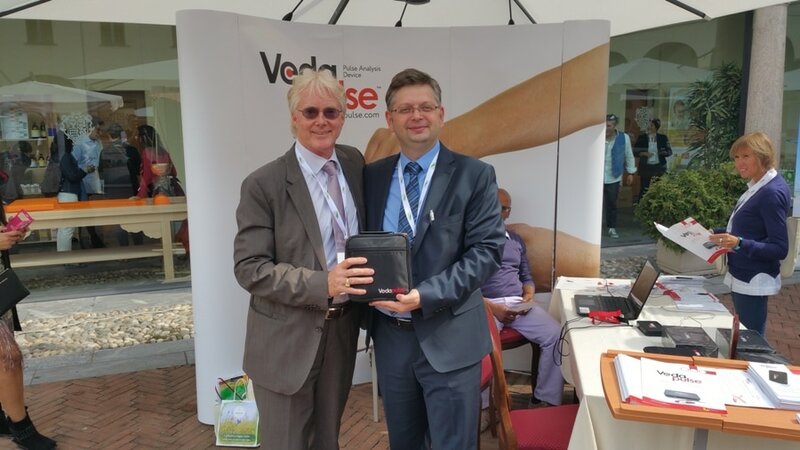 During the Congress there were many discussions about the results of VedaPulse algorithms study results. One of the practical outcomes was a preliminary agreement on the format of an expert group, which includes Dr. Ram Manohar, Dr. Antonio Morandi, Professor Antonella Della Fave, in order to develop the design of further studies, also performed as a part of the International Network for Development of Research in Ayurveda (INDRA). .
Ayurvedic Point is a company founded in 2001 with the aim of offering a service for the diffusion and development of Āyurveda and particularly of Ayurvedic Medicine. 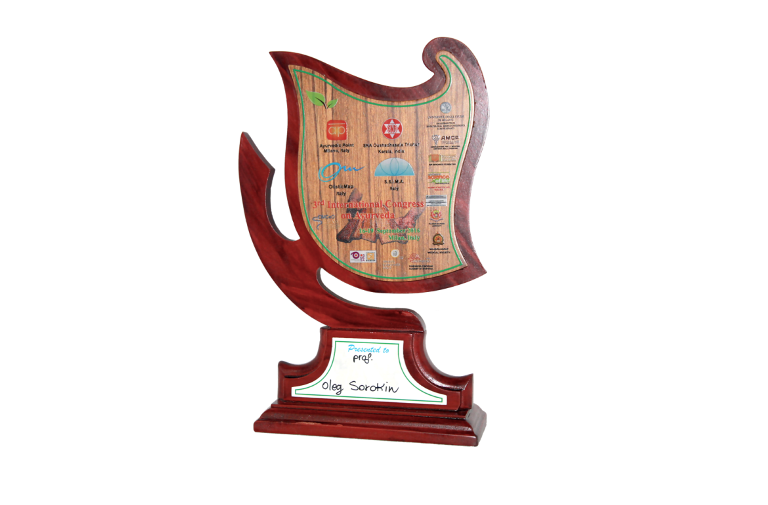 The activities of Ayurvedic Point are articulated in a cultural and educational sector (School of Āyurveda) and in a clinical and research field (Centre of Ayurvedic Medicine). The International Network for Research in Ayurveda (INDRA) is an initiative to bring together researchers around the world to engage in activities that can establish Ayurveda as a credible system of knowledge and health care. The word INDRA stands for a higher consciousness, a higher perception that is created by the coming together of the best minds in the field of Ayurveda. INDRA is also known as a SAHASRAKSA, possessing a thousand eyes. The network of INDRA is like a thousand eyes in the skies, serving as a beacon to propagate the spirit and essence of Ayurveda in multicultural environments inspired by multi-paradigmatic vision and multidisciplinary research. The goal of INDRA is to nurture research methods that are in tune with the epistemology of Ayurveda and at the same time will also match the rigour of modern science. INDRA aims to divest research reporting from all commercial motives and showcase the pure science behind Ayurveda. INDRA began as the annual meeting of a group of researchers at the European Academy of Ayurveda, Birstein, Germany in 2014. 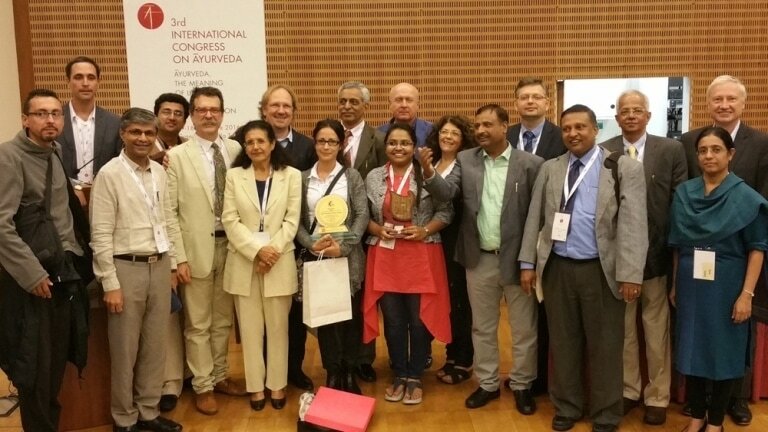 After the first two International Research Seminars on Ayurveda (IRSA), the network was renamed as International Network for Research in Ayurveda (INDRA) and the first INDRA meeting took place at Milan, Italy on 18, 19 and 20 September, 2016 in connection with the 3rd International Congress on Ayurveda organised by Ayurvedic Point and SNA Oushadhashala. The immediate goals of INDRA has been the drafting of a White Paper identifying the critical issues in the field of Ayurvedic research and to give recommendations and directions for future research. In the first phase, INDRA proposes to initiate work on Research Metrics to identify gaps in the current research on Ayurveda. During the meeting at Milan, Italy the first draft of the White Paper was presented and discussed identifying fifteen priority project ideas. Nurturing a young generation of skilled researchers is a priority of the INDRA initiative. With this goal in mind, the Young Researcher in Ayurveda Award was constituted at the very inception of the research network. For three consecutive years, Young Researchers have been picked by a process of peer review and awarded for their promising research work. Post Milan meeting, INDRA is now marching forward with a new website and expanding the network by joining hands with individuals and institutions committed to the vision and mission of INDRA.